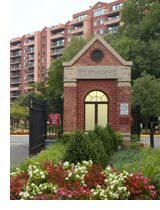 The Renaissance 2230 is a luxury conversion condominium situated on just over 21 acres of land located at 2230 George C. Marshall Drive; Falls Church, VA 22043-2580. The condominium consists of a single 12-story masonry and brick structure configured in three wings around a central lobby and includes 332 residential units ranging from single bedroom to three bedroom units and two spacious Penthouse apartments on top of the 12th floor. The condominium also includes a small number of commercial/retail spaces on the ground (1st) floor which are leased by the condominium association. Prior to commencing conversion to condominium status, the complex had comprised a luxury rental apartment community since its construction in 1988. In April 2005, the development company of Draper and Kramer (a Chicago-based developer) commenced refurbishment activities and transition to condominium status. In August 2006, with some 75% of units sold, control of condominium operations passed to the Renaissance 2230 Association under a Board of Directors elected by Unit Owners. Sales efforts were completed in the summer of 2007. In addition to the basic structure, the condominium includes an outdoor pool and tennis facilities, which are provided for the year-round enjoyment of its residents by means of inflatable “bubble” structures, both of which are removed during summer months. While the pool is staffed and operated under contract to the Association, the tennis courts are operated under a long-term lease providing for residential use during set hours. a Club Room available to residents at most times but also available for private rental; and a conference room for use by residents. Currently available retail services include a convenience store, a hair salon, and a dry cleaning establishment. Conversion of additional commercial retail space into additional office space or hospitality suites is also under consideration. The condominium’s grounds provide parking space for 650 vehicles and include 23 stand-alone garages and 201 reserved parking spaces, both of which comprise limited common elements of the association but which are reserved for the exclusive use of purchasing unit owners. The remainder of the available parking includes dedicated handicapped spaces and 413 “open” or unreserved spaces, which are available on a first-come basis. Vehicular access to the Renaissance 2230 grounds is confined to a single gated entry located at the southwest end of George C. Marshall Drive, which is remotely controlled and monitored via the condominium’s front desk. Access to the grounds is also afforded by electronic fobs and cards provided to Unit Owners/Residents. A gate house is situated at the gated entry point. The condominium’s front desk is manned 24/7 under the terms of a contract providing for security services. Other services provided under contract to the Association include provision of custodial services, elevator maintenance, pest control, fitness equipment maintenance, computer maintenance, and trash removal. Legal counsel is arranged separately by the Association. Overall financial and management support is currently provided under contract by GHA Community Management of Fairfax, Virginia, Full-time GHACM employees dedicated to the condominium include a Building Manager and an Assistant Building Manager as well as a Building Engineer and assistant Building Engineer. The Management Office is routinely open for business weekdays from 9:00 A.M. - 6:00 P.M. The Renaissance 2230 Association is governed by a five member Board of Directors elected by the Unit Owners. Members of the Board serve terms ranging from one to three years. The Board is assisted in its efforts by various committees composed of resident and non-resident unit owners as well as tenants of the condominium. Currently, the designated committees include Finance, Operations, Rules and Regulations, Communications, and Social and are chaired by non-members of the Board.